On Tuesday, April 2, the full-day students will hop a school bus at 11:30 and go to the Bushnell to see a performance of Rainbow Fish. We are grateful to CREC for providing funding for this event. These performances provide wonderful experiences that enhance our literacy curriculum. We have a student teacher for two weeks. Ms. Dee Dee is completing her training at the Montessori Training Center of New England. The Training Center is on our campus and directed by our own Gretchen Hall. Ms. Dee Dee is observing and providing some supervised lessons. It is a great opportunity for all of us. The full-day students are doing research about various biomes. The children have shown a particular interest in forests. So, today, we watched the Discovery Channel's Planet Earth video on Seasonal Forests. The children were entranced by the beauty and commented throughout about how animals and plants adapt to the environmental conditions of the forest biome. I am always dazzled by how their absorbent minds I'm sure that they will be talking about it for days. The bathroom above us flooded on thursday and the ceiling outside our bathroom began to leak in several places. It looked like rain. We are learning about Biomes and someone said that our room is now a rainforest.... nice idea! The leak is fixed and the ceiling tiles will be replaced next week. All is back to normal again! Today I was at a Workshop that focussed on Lucy Caulkins' approach to the Reading Workshop. I learned some wonderful new strategies to help readers with comprehension. Making patterns requires concentration and practice. 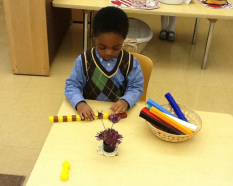 One reason a Montessori classroom is quiet is because children are busy figuring things out. Winter is definitely here. It's time for warm soup. Our youngest children learn to wash and cut the vegetables that go into the crock pot. We make pea soup, chicken vegetable soup and one of their favorites, tomato soup made with half milk and half water. On other days, we bake crescent rolls or toast cinnamon bread. These are not only warm and delicious but allow little hands practice spreading butter or cream cheese. Last week, children learned to mash, cut and bake with bananas. Cutting bananas is a classic Montessori lesson for 3 1/2 year olds. If you want our Banana Bread recipe, click on, FOR PARENTS and then click on Recipes. On Friday, December 21, our Room Parents will sponsor Cookie Decorating. They will bring the cookies, icing and sprinkles so everyone will get to decorate two cookies. One will be to eat and the other to take home. Watch for pictures to come! The children are excited about the Book Fair. They ooh and ahhh as they pass the tables of books. Owning books is a wonderful thing for all of us. I hope that you let your child roam and find one that is just right. Since this week is full of half days, we are doing some crafts and baking more than usual. Today, two children baked cranberry bread. We will have it for snack tomorrow. Last week, we read the Gingerbread Baby by Jan Brett and had gingerbread cookies for snack. This is my ninth year as a Montessori Primary Guide at MMS. I was honored to be in the first graduating class of the Montessori Training Center of New England. MTCNE is an AMI Training Center that is located here on the Learning Corridor Campus. I was drawn to the Montessori Philosophy because it is the way that I live my life. Maria Montessori believed that children need to be close to nature and to learn about real things. I love nature and find peace and relaxation by living on a pond. Every day, I enjoy the turtles, heron, geese and the beauty of nature. I also practice Yoga. It is a graceful and peaceful way of keeping me flexible and strong both physically and spiritually. Like Montessori, I have a deep respect for the genius and miracle of the child. I have always been fascinated by how we learn and in finding ways to help individuals meet their optimal potential. A key aspect of the Montessori Method is to become a keen observer of the child. There is nothing I love more than to watch an individual child explore and to identify the unique way that learning takes place. I constantly read and learn about the way that the brain works and try to find techniques to support a child’s growth. For me, creating the prepared environment is one of the joys of being a Montessori guide. I love to quilt, do crafts and make things look beautiful. I have made many of the materials in our classroom and totally enjoy working with the children to create our garden with herbs and flowers that we use in the classroom. Cooking with the children is also something that I love to do. The Montessori philosophy emphasizes peace, grace and courtesy, control of the will, independence, individuality, nature, creativity and exploration. These characteristics provide a foundation that is important for the child and also provides my center.